Abstract: The paper examines ATB and parasitic gap structures in Polish in order to determine whether they can be conflated into a single phenomenon. Three available approaches to these two constructions are outlined and evaluated as to their applicability to Polish data. It is argued that the approach postulating the treatment of parasitic gaps as a special case of ATB put forward by Huybregts and van Riemsdijk (1985) and Williams (1990) is problematic as it does not specify how parasitic gap constructions are assigned the coordinate status. The second approach arguing in favor of subsuming ATB gaps under parasitic gaps, advocated by Munn (1992) and Franks (1993, 1995), is more advantageous. Franks’s analysis is scrutinized in detail, as it directly deals with Polish. It is argued that there exist ATB and parasitic gaps which violate both Franks’s thematic prominence condition and his case identity requirement. It is suggested that mere morphological case identity is not sufficient and should be supplemented with identity in abstract Case, perhaps along the lines of Dyła (1984). Next, we examine the third approach, proposed by Postal (1993), suggesting that parasitic gaps and ATB gaps do not represent a single phenomenon and therefore should be kept separate. It is pointed out that the differences between Polish parasitic gaps and ATB gaps are not uniquely characteristic for these two types of structure and that is why they cannot serve as sufficient evidence for claiming that the two examined constructions are instances of distinct phenomena. A conclusion along these lines is reached independently by Hornstein and Nunes (2002) on the basis of English and Portuguese data. Their analysis generally turns out to be applicable also to Polish ATB and parasitic gaps, and only the sentences where case mismatch occurs or where thematic prominence is violated require a separate explanation. 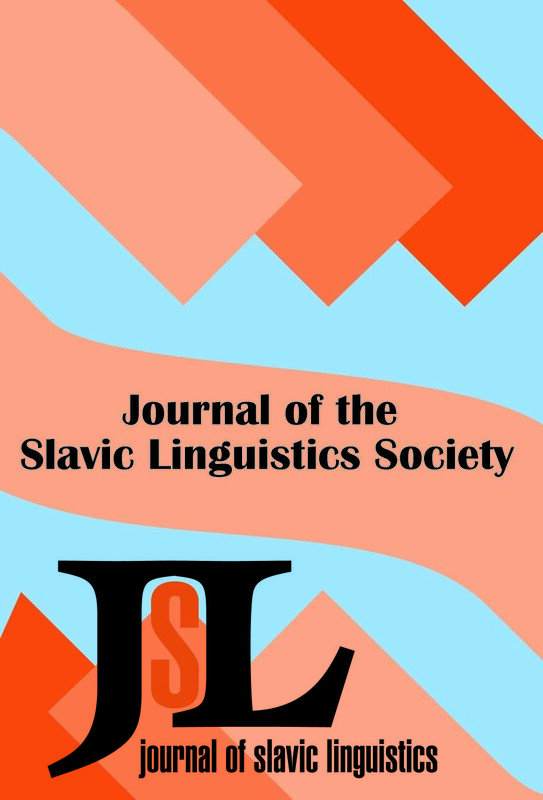 Abstract: The goal of this paper is to show that the Common Slavic monophthongization of diphthongs was a much more uniform process than has been thought. There are two main types of rules, depending on whether the two moraic components of the diphthong have a pure sonority contrast (± consonantal or ± high) or a sonority contrast in addition to one of nasality or front/back. In the case of the pure sonority contrast, one of the input moras becomes the moraic unit of the new two-mora monophthong. The question of whether it is the first or second mora depends on the sonority distance between the diphthongal components; in the unmarked case of lesser sonority distance, the second component is generalized in the monophthong, but a greater sonority distance causes the first component to become the moraic unit of the monophthong. When the diphthongal contrast involves sonority plus nasality or front/back, the non-nasal or back component first experiences assimilation to nasality or frontness and then serves as the moraic model for the resulting monophthong. These two basic rule types can be readily applied to both glide and nasal diphthongs, with the proviso that non-high vowels must be considered low (ä, a), rather than the traditionally assumed mid vowels (e, o). However, in the case of liquid diphthongs, there is an important difference of relative chronology between southern and northern zones. Southern zones experience the change of short vowels to mid only after the monophthongization of liquid diphthongs, while the northern zones first undergo the change of short vowel > mid, and only then monophthongize the liquid diphthongs. The presence of unchanged low and high vowels (*tart and *turt) accounts for the southern reflexes, while the new mid vowel combinations of the North (*tort and *tərt) account for the northern results. Thus, virtually all of the diphthongal reflexes of Slavic can be explained by: 1) recognizing differing monophthongization rules for pure sonority contrasts, as contrasted with sonority in combination with nasality or front/back; and 2) recognizing the differing northern and southern relative chronologies for monophthongization and short vowel > mid in the last set of diphthongs to monophthongize, which are the liquids. Abstract: This paper investigates the predictability of gender and declension of Russian nouns ending in soft consonants. It is argued that morphologically complex nouns and nouns denoting animates show nearly full predictability. For simplex inanimate nouns, clear statistical tendencies are documented based on stress patterns and the quality of the penultimate and final segments of the stem. In addition to explicating morphological, semantic, and phonological generalizations, the paper offers a detailed investigation of their interaction, for which an assignment hierarchy is advanced. The assignment of gender and declension is shown to be systematic and well behaved in that highly ranked generalizations consistently take precedence over those further down. Abstract: The Lemkos are one of a number of Ruthenian peoples inhabiting the Carpathian mountains. Their language belongs to the group of Southwest Ukrainian dialects. In the late 1940s, immediately following the second World War, most of the Lemkos were forced to abandon their homeland in the Beskid Niski, a Carpathian range between the Tatras and the Bieszczady, which forms part of the border between Poland and Slovakia. Many of them were sent to areas in Western Poland that had been part of Germany before the war, while the rest ended up in the Soviet Union. In the past couple of decades, many Lemkos have returned to the Beskid Niski. While the speech of the Lemkos before World War II was well documented in the works of Zdzisław Stieber, this author is unaware of any works examining the linguistic effects of their resettlement in Polish-speaking areas. This paper provides an acoustic phonetic characterization of the Lemkos’ voiceless affricates both in their own dialect and when they speak Polish, focusing on the distinction between the palato-alveolar /tʃ/ and the alveolo-palatal /tɕ/. An examination of the dental affricate [ts] is added for descriptive purposes, but this segment remains outside the contrast under study. The paper will go on to discuss the perceptual implications of the contrast, variation among speakers, and related sociolinguistic implications.